Apologies to readers. This article was published in error. This well-known Caledonia agitator’s antics have escalated with this most recent stunt on the weekend. […] Anyone with common sense knows no good can come of pulling these types of stunts repeatedly without there being consequences. Gary McHale must quit pulling the scab off this festering wound, and shame on Barrett for backing this type of reckless behaviour. They are bringing nothing but negative attention to the town of Caledonia and trivializing Six Nations land grievances. These antics serve no purpose other than to inflame a situation that has been on simmer for the past six years. Feb. 28 will be the sixth anniversary of this land dispute in Caledonia. And sadly nothing has changed. VoiceofCanada, Feb 22/12: Jerry Agar, CFRB/SUN TV: ‘Caledonia is a festering boil of racist policy’ that discriminates against Whites, Blacks, Jews, etc. While to some it appears inherently wrong ever to disagree with a native person, I have to say that Ms. Bomberry’s view that nothing has changed since 2006 is not supported by the evidence. Here are10 things that have changed since 2006. 1) Contrary to the Native occupiers’ view, Six Nation Band Council has repeatedly told the court there is no claim on title to people’s property. Judges have agreed. 2) Courts have repeatedly disagreed with the OPP refusal to enforce the law and have even rebuked the OPP for targeting legal property owners instead of Native protesters. 3) The OPP has been forced to accept that property owners do have the right to have Native trespassers arrested. 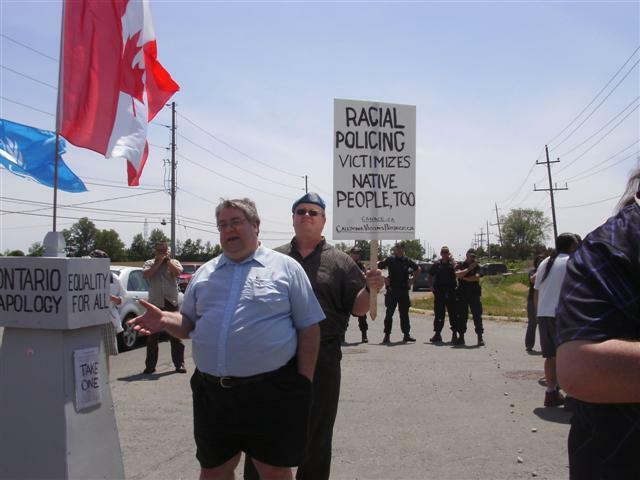 My name is Stuart Laughton and I am here on behalf of the Never Again Group, an organization that supports Gary McHale in his group’s fight against racially biased policing in Caledonia, just as he has supported us elsewhere. The Never Again Group is based in Hamilton—which is very close to Caledonia—and our membership is about 1/2 Jewish. We defend the state of Israel from baseless accusations and we fight anti-Semitism in its various guises. The Never Again Group does not believe that the Ontario government’s directives to police in Caledonia began with ill intentions—and we don’t know anyone who believes that Premier McGuinty is specifically targeting Jews there—but these directives were nevertheless profoundly wrong and dangerous in ways Canadians are only now beginning to appreciate. I want to stress that my group has made no opposition to Natives who make land claims: we only protest the violent manner in which the claims to the Caledonia property are made and the racially skewed responses of the Ontario government. The Israel-based world media watchdog, Honest Reporting, which claims over 140,000 subscribers, has honoured one of Canada’s Never Again Group members with its ‘Letter of the Month’ award for November 2011. Day 11 of 'Blue Beret' vigil outside London (Ontario, Canada) Muslim Mosque. 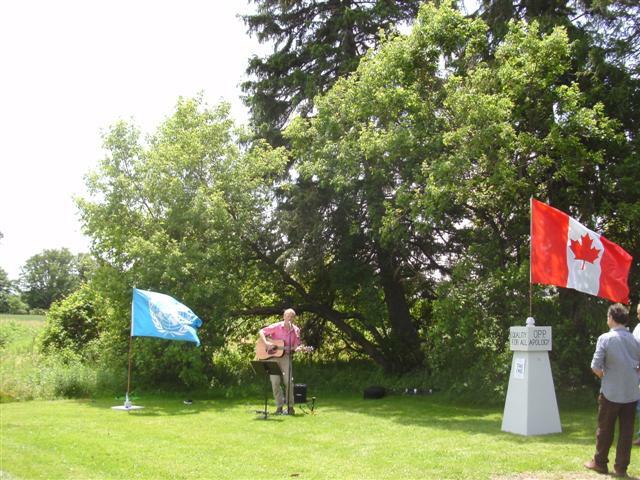 In foreground, Pesach Ovadyah (Chair, Jewish Defence League - London), former peacekeeper Mark Vandermaas (organizer), Steve Scheffer (Never Again Group, Hamilton), July 03/11. PHOTO: Christine McHale, Canadian Advocates for Charter Equality. In actuality, Steve Scheffer (wearing Israeli flag in photo above on Day 11 of my Blue Beret vigil) is being recognized for having two letters published in the Hamilton Spectator in defence of truth in the Middle East, letters in which he condemns Islamist hate for Jews and points out that it is this hatred that is the obstacle to peace, not Israeli intransigence. Something changed in Caledonia yesterday. In a way never before seen in the history of the Caledonia crisis both the OPP and the occupiers of the Douglas Creek Estates displayed great respect for the rights of non-natives at yesterday’s CANACE/Caledonia Victims Project Truth & Reconciliation Rally yesterday, and that respect resulted in us being able to place our symbolic Apology/Reconciliation monument on the paved entrance to DCE while we made some short speeches and answered questions from the media. The contrast between the conduct of the OPP and the occupiers yesterday compared to our Feb 27th and March 27th attempts to place our monument couldn’t have been more stark. During those attempts the OPP stood by as occupiers bumped, assaulted, and screamed insults at us from inches away, and falsely accused us of assault. During the March rally officers watched as our monument was stolen from us by occupiers, destroyed and then burnt with our Canadian flag. Yesterday’s event, however, was nothing short of remarkable. Enter your email address to receive notifications of new posts on VoiceofCanada by email. 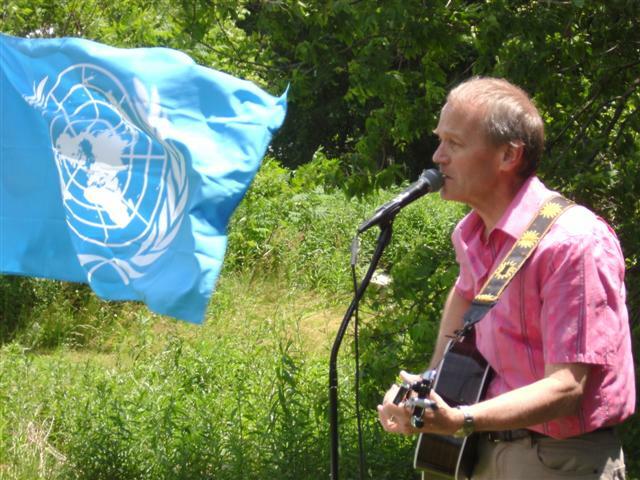 I believe in CANACE principles respecting the rule of law and protection of human rights. MARCH 22/11: FREE THINKING FILM SOCIETY & INTERNATIONAL FREE PRESS SOCIETY BRING CALEDONIA TO OTTAWA! Save the planet…from climate clowns! “One of most disliked men in Canada” to receive Queen’s Diamond Jubilee Medal for Caledonia leadership…congrats to Gary McHale! "You are all to be commended for doing so much, for so many with so little support. Your effort alone makes me want to weep for those who cannot appreciate the enormity of what has so far transpired." MOVIE: Indoctrinate U: Our Education. Their Politics. Oprah flash mob "It's gonna be a good day!" "There are many injustices going on in Canada at the moment, especially in First Nation Territory. They could sure use a man of your passion to give them a hand! Sincerely, Rob"